A daily devotional utility that serves up great content from sovereign grace writers! Grace Gems has become an essential devotional for people around the world! Download today and see what all the fuss is about! New content is added every day from some of the world's most renowed authors! The latest gems are always available from the main menu, so you can be sure to stay caught up. 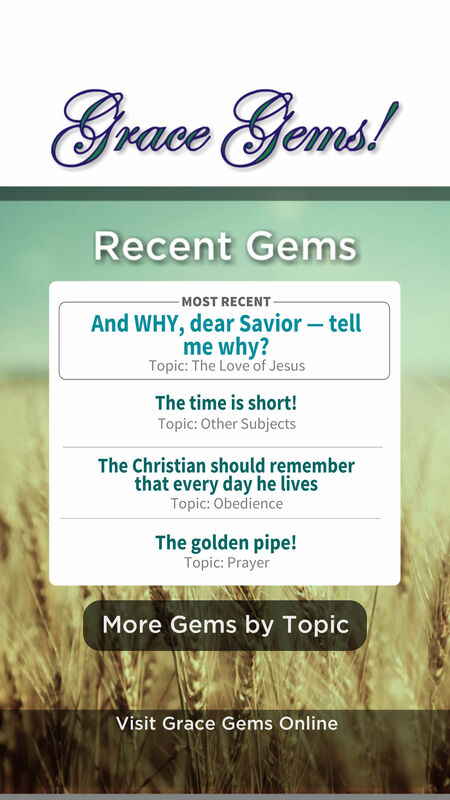 Unlike many devotional apps, the complete Grace Gems library is available. Simply select the category you would like to read about and you have plenty of great content. Users receive daily push notifications to stay up to date on the latest devotional. What's great content if it's not shared? All devotionals can be shared via Twitter, Facebook, SMS and more!